During August 2010, the Policy Planning Unit (PPU) of the Education Department, Government of Karnataka, organised workshops to train 120 government teacher educators’ from DIETs and BRCs, as 'Master Trainers on Public Software educational tools' with resource support from Sarva Shiksha Abhiyan (SSA) and Azim Premji Foundation, infrastructure support from RV College of Engineering and faculty from IT for Change and RV Educational Consortium. The participants came from all parts of Karnataka and worked with teachers in their respective districts to build their capacities to use these tools in their regular teaching-learning processes in mathematics, science and social science subjects. Almost all computer programmes in schools have so far primarily focused on teachers and students acquiring basic computer skills, without much attention being given to 'computer aided learning'. The teachers also have no opportunity to use the basic computer skills acquired, which means that the training often becomes redundant and irrelevant. The workshop premise was that shifting to training teachers to use ICT educational tools to teach regular subject would increase teachers' ownership and commitment to use new possibilities offered by ICTs. This would consequently lead to a more effective use of the ICT tools in the schools. 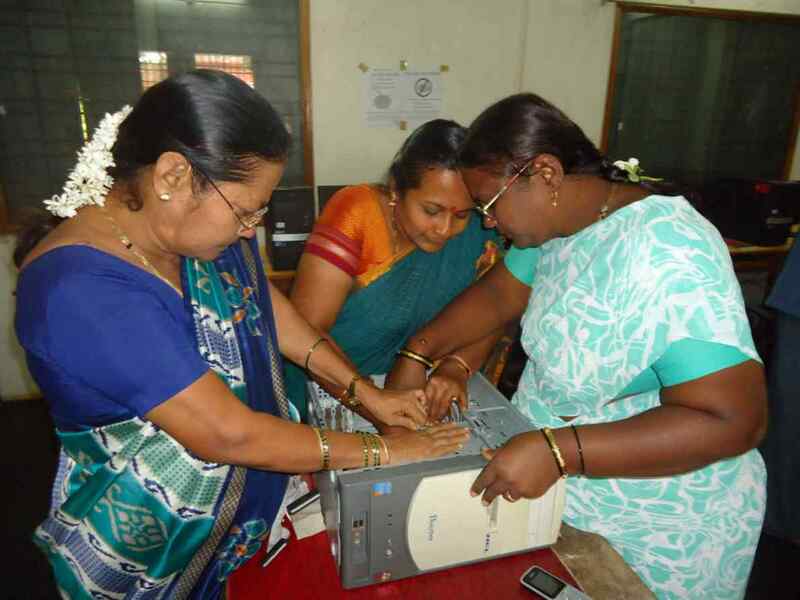 This was the first programme in the Karnataka public education system that focussed on ICT educational tools, covering mathematics (Geogebra), science (KTech), english (KAnagram) and geography/environmental sciences (KGeography, KStars). Since these tools are publicly owned, a copy of the software applications was given to all the master trainers to install in their offices and elsewhere. Master trainers from the Kerala IT @ Schools programme (which has pioneered the use of such public software educational tools), invited by Azim Premji Foundation, also shared their ideas, lesson plans and gave feedback to the participants . These ICT tools adopt a learner-centered approach based on a constructivist learning, i.e. knowledge is actively constructed by the learner, building on her/his existing knowledge and it is not passively received from the teacher. The premise also is that by the teacher herself experiencing this pedagogical approach through use of these educational tools, she would be more amenable and able to adopt it while teaching in her classroom. In order to move beyond a narrow 'tool focus' of ICTs, where techno-fascination is often a serious limitation and even danger of such programsme, the programme also had sessions on educational perspectives and the National Curriculum Framework 2005, where the potential of ICTs to support constructivistic teaching-learning approaches was discussed. The programme resources are available here. The participants were enthusiastic about the possibilities of these tools in daily teaching learning processes. Some even came up with creative lesson plans on the above tools taught. An e-mail list was created for them to network, discuss these tools and also share their ideas, issues and solutions. The assessment process for these participants included reviewing their pre-training and post-training learning through simple tests, participation during the training and reading the ‘reflections’ written by them after each days training. The participants who would be ‘certified’ as master trainers based on the assessment, would train five high school teachers in each block who would then train their colleagues over the next three years.